Do you feel weary or even a bit jaded? Tired and overworked, but can't seem to find a respite? Not even a rejuvenating vacation seems to chase this nagging, insipid feeling away? We are all prone to a sleepiness of the soul. That raging fire of love that was once within dwindles slowly, often extinguishing without notice. Like an unknown cancer, this spreading toxin clouds your reasoning and enfeebles your will. Your spirit feels somehow empty and your joy becomes fleeting if not faded. Like any relationship of love, the soul's friendship with God must always be reinvented, refreshed, and renewed. When the honeymoon is over, the real work begins. 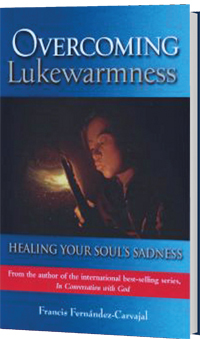 This brilliant volume—fully revised and remastered by Francis Fernandez-Carvajal—will help you to squelch that silent poison within: lukewarmness. From the creator of the internationally best-selling In Conversation with God series, this indispensable guide can truly change your life. Learn how to defeat the “noonday devil”—that sluggish tepidity within—by rekindling the incomparable joy of following Christ. You will find that an unwavering cheerfulness will begin to pervade every area of your being and that what once was dying will be filled with life: the life of true love.